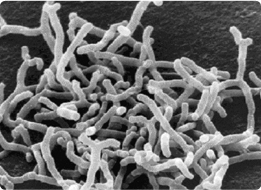 Bifidobacteria are the predominant bacteria living in the gastrointestinal tract of a healthy human being. Over a long period of time, Morinaga Milk has discovered the positive attributes of the strain BB536 that is derived from a healthy infant. The benefits include intestinal regulation, protection from infection, and immune modulation. Recently, our research group presented evidence to an academic conference outlining certain health benefits for the elderly. In addition, a test among pregnant women and newborns showed that after taking BB536 along with Bifidobacterium breve M-16V, another probiotic strain from Morinaga Milk, the infants exhibited a dramatic reduced prevalence of eczema and atopic dermatitis. Milk drinks, lactic acid drinks and yogurt products containing BB536 are now among Morinaga Milk's core products. BB536 and M-16V are not only marketed in Japan, but also the strains are exported to many countries around the world. Although consumers have told us that BB536 has helped improve intestinal conditions and lessen hay fever symptoms, we have fortunately succeeded in obtaining many scientific data to substantiate such effects. Obtaining such substantiating data is challenging, but the challenge motivates me to establish that scientific evidence because by doing so I can contribute to improving the health of our consumers. I am very pleased to be involved in this research.